You'll be £30.00 closer to your next £10.00 credit when you purchase A Shipyard at War. What's this? Although best known for large liners and capital ships, between 1914 and the completion of the wartime programmes in 1920 the Clydebank shipyard of John Brown & Sons built a vast range of vessels – major warships down to destroyers and submarines, unusual designs like a seaplane carrier and submarine depot ship, and even a batch of war-standard merchant ships. This makes the yard a particularly good exemplar of the wartime shipbuilding effort. Like most shipyards of the time, Clydebank employed professional photographers to record the whole process of construction, using large-plate cameras that produced pictures of stunning clarity and detail; but unlike most shipyard photography, Clydebank's collection has survived, although relatively few of the images have ever been published. For this book some 200 of the most telling were carefully selected, and scanned to the highest standards, depicting in unprecedented detail every aspect of the yard's output, from the liner Aquitania in 1914 to the cruiser Enterprise, completed in 1920. Although ships are the main focus of the book, the photos also chronicle the impact of the war on working conditions in the yard and, perhaps most noticeable in the introduction of women in large numbers to the workforce. With lengthy and informative captions, and an authoritative introduction by Ian Johnston, this book is a vivid portrait of a lost industry at the height of its success. ...this book is a little treasure trove, and an invaluable addition to the maritime archaeology of 20th century Britain. With length and informative captions this book is a vivid portrait of a lost industry at the height of its success. 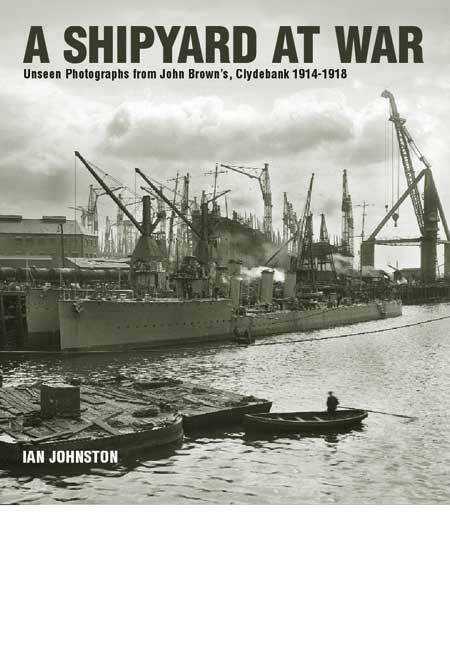 [This book] is a great addition to Ian Johnson's series of books on John Brown's and a valuable contribution to the study of Clydeside ship building as whole. Anyone with an interest in industrial history and in matters mechanical and engineering will find this book singularly revealing. This is a simply fascinating collection of archive photographs from the period of WWI, when the British shipbuilding industry was at something of a high point. ... The detail in the photos is just exquisite. The quality of the reproduction is superb and the book is a fantastic memorial to the famous shipyard on Clydebank and those who worked there. Professionally composed photos detail the construction of HMS Barham, the Repulse and the ill-fated HMS Hood, recording the heyday of ship building on the Clyde. With this excellent book Ian Johnston has ticked all the right boxes for me and if you have the slightest interest in either warships or photography I can safely say you will not be disappointed. Ian Johnston has selected some 200 black and white images that have been reproduced to a very high standard and captioned to give insight into the yards activities as it built a wide range of ships for the war effort... There is a wealth of detail here and the book is worth every penny of its purchase price. This book is very valuable to anyone interested in World War One warships, their design and construction. Ian Johnston has produced an excellent book to present these significant, high quality photographs...This book will be a classic. A historian has added a gem to the ever growing pile of publications covering Clydebank's industrial past. The hardback features stunning never-seen-before snaps of the world renowned shipyard taken between 1914 and 1918. Following on from his book on Clydebank Battlecruisers in 2012, Johnston has written another using archive photographs showing the ships built by John Brown, a name that is synonymous with shipbuilding on the Clyde. The storied shipyard built some of the finest and most famous ships of the 20th century. Johnston has laid the book out in chronological order from pre-war ships to 1918. After an informative introduction, he moves to the main subjects of the book; photographs of the construction of liners, warships and merchant ships. However, he doesn't just bring us a collection of pretty pictures, but instead gives us an idea of how long ships took to build, bringing the wartime life of the shipyard into focus. He takes pains to acknowledge the skills of the photographers who made his book possible. All in all, it is a well-constructed, informative and illustrative tome and if you have the slightest interest in warships or photography, you will not be disappointed with this book. The publishing process has done full justice to the original quality of the glass-plate negatives and the author's captions 'talk you into the pictures' to describe the visible activities. Worth every penny and thoroughly recommended. The detail the photographs show is nothing short of remarkable. As seen in The Herald Magazine.